Tom was one of the best hurlers in the parish born on Aug 24th 1918. Unfortunately he reached maturity at a time when Lorrha were relegated to intermediate level. Equally so in the absence of Inter county junior championship during the war years, he never got the recognition he deserved on the big stage. Tom started playing senior hurling in 1938, following two unsuccessful years in the junior ranks. Lorrha won the county intermediate title in 1946 after a tough encounter against Maycarkey-Borris at Gaile, and went Senior. Divisional senior success followed in 1948 before defeat by Holycross-Ballycahill in the county final. Tom was thirty years old in that final. He got a call up for a county trial the same year and went to Ennis for a match against Clare, but was never called of the bench. He made a return to the game in 1959, as full-back on the junior team and had as company Billy Hogan and Hubie Hogan and Mick Brophy. They had some success and Tom served as a selector on the senior team with Billy Hogan for a couple of years around 1970. The athletics club was founded in Lorrha in 1940 St. Ruadhan’s Athletic Club. Lorrha was associated with the Nenagh, Ballinderry and Rathcabbin. Tom was an active member of the Athletic’s club. The club made its first appearance in competition in Nenagh on Jan 16th 1944. This was the Tipperary Junior Championship and out of a field of two hundred and eighty runners, St. Ruadhan’s won individual and team honours. St Ruadhan’s next competed in Tipperary Town on Feb 23rd 1944. They took the team event in the County Junior Championship from a very big field. The team consisted of Michael Hourigan, Francey Hourigan, Tom Lambe, Peter Coughlan and Patsy Carroll. On the last Sunday of February that year the team went to Dunleer for the All-Ireland Inter club Cross Country Junior Championships and came sixth out of a field of over sixty teams. At the end of the season St. Ruadhan’s won the open Six Mile Cross Country at Birr. A revival of interest in Athletics began in 1979 when a meeting was held in Rathcabbin Hall in October and St. Ruadhan’s A.C. was reformed with Patsy Carroll President, F. Maher, Chairman, P. Kelly, Secretary, Mary Molloy, treasurer and Caroline Molloy, P.R.O. The club achieved early success, winning the county novice in 1980 and second in the Junior and sixth in the Senior. In 1982 the men were second in the Novice and Junior and third in the County senior when the competition was held on Tom Lambe’s land at Coolross, Rathcabbin. Tom married Nancy Sherlock in August 1949 and lived in Coolross Rathcabbin, where he continues to live. 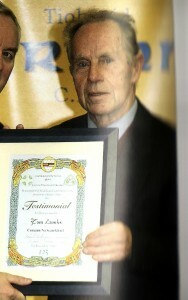 Tom received a Sean Gheal award from G.A.A. president, Christy Cooney, at the Dome, Semple Stadium, Thurles on November 1st 2010.